A fascinating jurisdictional tug-of-war has broken out between federal OSHA and a few fed OSHA approved State OSH Programs, in relation to OSHA’s Final Rule to “Improve Tracking of Workplace Injuries and Illnesses” (aka the E-Recordkeeping Rule). The E-Recordkeeping Rule requires large employers and smaller employees that operate in certain “high hazard industries” to proactively submit their electronic injury and illness data to OSHA through a special web portal – the Injury Tracking Application (“ITA”). When fed OSHA promulgated the Rule in 2016, it built into the Rule a mandate that all State Plans adopt substantially identical requirements to the final E-Recordkeeping Rule within six months after its publication. However, because the State Plan states all have their own legislative or rulemaking processes, they cannot simply snap their fingers and instantly adopt a new fed OSHA rule. The delay by these States has primarily been a result of fed OSHA’s numerous announcements that it will soon issue a Notice of Proposed Rulemaking to amend (or rescind) the federal E-Recordkeeping Rule. The State Plans have been reluctant to invest the time and resources to implement their own versions of the rule, only to watch fed OSHA change it, causing the states to have to change their own rules again very soon. Of those eight states, only Vermont has since finalized its E-Recordkeeping Rule this year, and the other seven remain delinquent in their obligation to adopt the Rule. 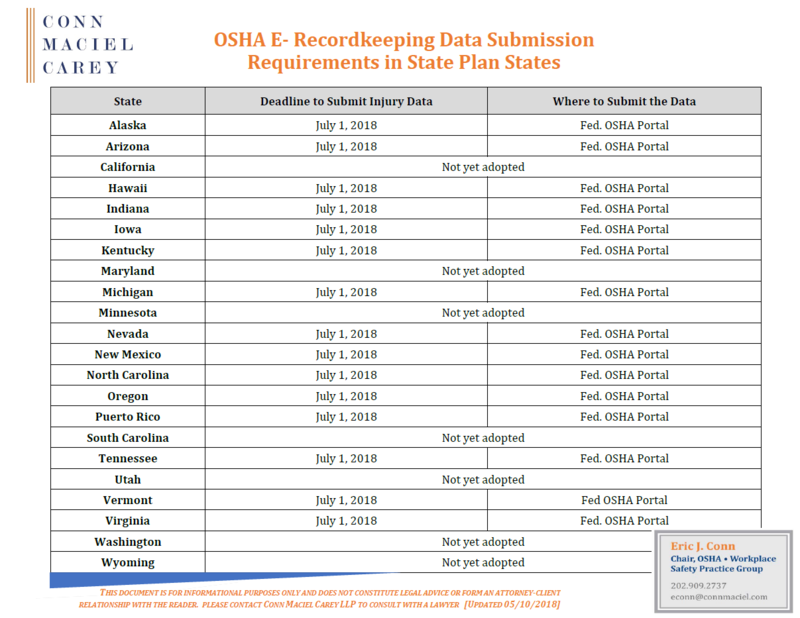 Last year, fed OSHA and those eight state plans apparently recognized that only employers in fed OSHA states or State Plan states that had already adopted the E-Recordkeeping rule were required to submit their 300A data to OSHA. This year, however, fed OSHA spoke up about the delinquent states. 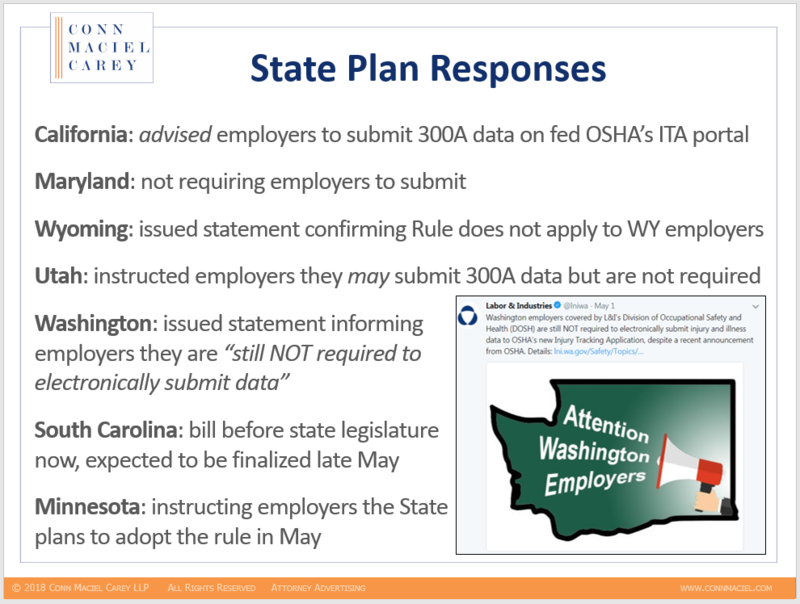 With only two months until the July 1, 2018 deadline for year two of injury data submissions, fed OSHA sparked a big controversy with an April 30, 2018 Press Release instructing employers with establishments in state plan states where the rule has not yet been finalized to submit their 300A data by the July 1st deadline anyway. Pushing back against fed OSHA’s call for employers in their states to submit data. Minnesota and South Carolina expressed they are both planning to adopt the rule sometime this month (in May 2018), but it is unclear when and if that will be completed with sufficient time for employers there to comply with a July 1, 2018 submission deadline. Obviously, OSHA’s directive, which seemingly impinges on the state’s exclusive jurisdiction, and the responses to this directive by the seven states that have not yet adopted the rule, has caused significant confusion. Our legal analysis leads us to conclude that employers in those states (California, Washington, etc.) need not submit the data this year, assuming those states do not adopt an E-Recordkeeping Rule in the immediate future. The OSH Act provision cited by fed OSHA, Sec. 18(c)(7), does not give fed OSHA any authority over employers in state plan states. Rather, that provision sets the minimum criteria that a State OSH Plan must meet to be eligible to be approved by fed OSHA. In other words, the provision gives fed OSHA authority over State Plans, to require the State Plans to include certain elements, or be denied approved status. That provision of the Act, however, does not grant fed OSHA any authority over employers in those State Plan states. The mechanism fed OSHA chose to implement its recordkeeping regulations – and which it has consistently followed since the OSH Act was promulgated – is through the state plan approval process; i.e., State Plans must implement recordkeeping provisions identical or more stringent than fed OSHA’s recordkeeping provisions. If a state plan fails to adopt the E-Recordkeeping rule, or otherwise does not meet some minimum requirement to operate an approved State OSH Plan, then fed OSHA’s remedy is to rescind the State Plan’s approved status (or threaten to do so), but only after rescinding the State Plan’s authority would fed OSHA resume jurisdiction over employers in that state. Short of that, fed OSHA may not inspect, cite, or direct employers in State Plan States to take any actions. The more the various agencies talk about this controversy, the more it becomes clear that none of the agencies, including fed OSHA that directed employers to act, and State Plans like Cal/OSHA that have advised their constituents to submit data, believe that fed OSHA’s direction is actually enforceable. For example, a California employer that does not submit data cannot be cited by fed OSHA for declining to submit injury data, because fed OSHA cannot inspect and cite employers in California. Likewise, that same California employer may not be cited for declining to submit its injury data by Cal/OSHA, because Cal/OSHA does not have a regulatory requirement to submit the data on its books to cite. What Does This Mean for Employers in State Plans that Haven’t Adopted the Rule? There is presently no legal requirement for employers operating in Washington, Maryland, Minnesota, South Carolina, Wyoming, and California to submit 300A data. Federal OSHA does not have authority to compel employers with establishments in those states to submit data, and neither federal OSHA nor the state OSH agencies can cite a violation under 29 C.F.R. 1904.41, because that regulation does not apply to employers in State Plan States. OSHA’s justification in its press release is an overreach – attempting to correct an area where state plans have failed to act, by inserting itself into the business of employers in those states. But OSHA does not have jurisdiction over employers with establishments in those states that have not adopted the rule and the remedy announced in its April 30th press release is certainly not the proper or legal remedy. Therefore, we do not recommend employers in those states submit data until it is legally required. OSHA has already announced it is using the data collected to target enforcement resources. 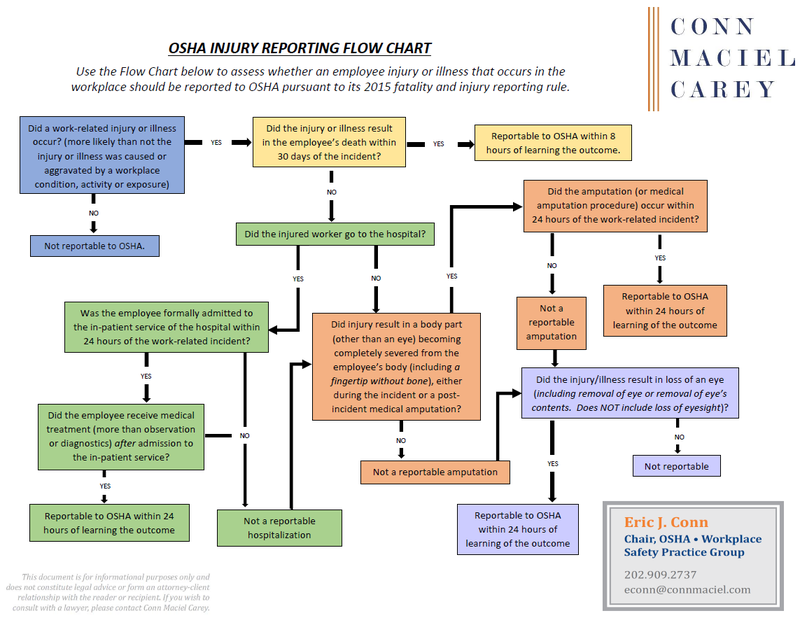 No employer would “report” to OSHA an injury that does not meet the reporting criteria, so why would an employer submit injury data to OSHA when no regulatory requirement exists? We would, however carefully track the progress of the State Plans towards adoption of the rule. This move by Fed OSHA was an attempt to put pressure on those few delinquent states to get the rule done. And several of the states appear to be scrambling now to do just that, even before the July 1st deadline that is looming. — NOTE: Our analysis is focused on employers whose operations are covered exclusively by the State Plan. Of course, if employers in those states are operating on military installations or other federal lands, or engage in maritime operations, where federal OSHA maintains exclusive or concurrent jurisdiction, our analysis does not apply. In other words, if fed OSHA has the authority to inspect and cite (even if it is concurrent jurisdiction), then employers should implement the E-Recordkeeping Rule. For more information on this issue, give a listen to the recording of Conn Maciel Carey’s May 15, 2018 webinar: “The Latest on OSHA’s E-Recordkeeping and Anti-Retaliation Rule,” or check out these additional articles from the OSHA Defense Report blog about OSHA’s E-Recordkeeping Rule.